For property investors, it is important to understand risk in the country of property purchase. One of the key risks is corruption. This can be in the form of property title being invalid, being "ripped off", have government, public sector or private sector individuals or entities needing illicit payments for different "favour" and the like. For property investors, its best to avoid all this corruption - in corrupt countries, if you are honest, you have a higher chance of being "ripped off". A score of 100 is the least corrupt (Denmark and Finland score 90, the highest globally rated countries). A score of 0 is the most corrupt (Somalia scored 8 in 2012, the most corrupt country in the ranking). People will often equate corruption with poverty - what the analysis we have performed does, is show how some fairly wealthy countries with a certain language group are still fairly corrupt, whilst some reasonably poor countries with a certain language group are not as corrupt as one would expect for their level of poverty. Poverty is often equated to corruption - and whilst it is the general trend - our analysis shows that language group can show some interesting outliers to this trend. Whether corruption leads to poverty or corruption follows poverty is probably debatable, and there are many cultural overprints at play. The results of our analysis are outlined below. You will see for instance that Italy is a significant outlier - it has high levels of perceive public sector-government corruption compared to the per capital income per person. Russian speaking countries and Persian speaking countries also do not fair well. However, Swahili speaking countries have less perceived corruption despite the very low per capita income. English speaking countries on average do slightly better than average - even though their are hundreds of millions of English speaking nations that are poor (in Africa for instance) - dragging down the GDP per capita to only $10,547 per annum. 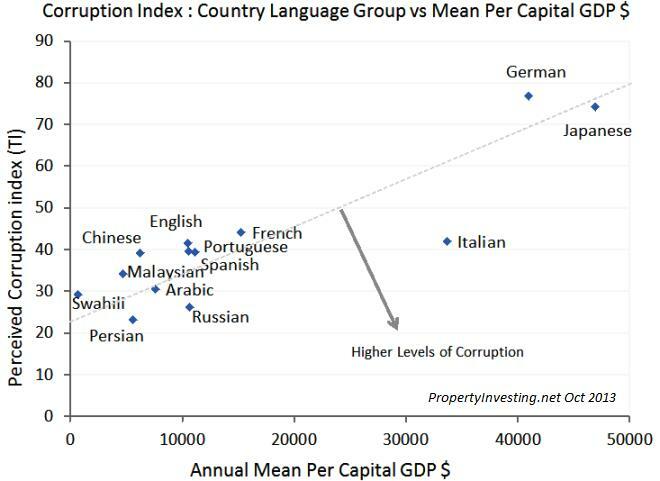 Portuguese and Spanish have similar values - all three language groups used to have large "colonies" - and have surprisingly similar values for both corruption and average per capita income when grouped. We don't really want to make too many judgements based on the analysis - we'd rather just show the chart and you can read your own conclusions. What we would like to stress though is that this is the first time we have seen such an analysis - it is unique - and it has been accurately determined using our extensive country database for all 260 countries of the world with these language groups, representing 84% of the world's population - 5.9 billion people out of 7 billion. Below is the grouped dataset - compilation of all 260 countries. As a side note, for all business people wanting to consider learning languages, it becomes very obvious from this tabulation that English is the key business language to learn at present simply because of the gigantic $23 Trillion overall global GDP generated from English speaking countries around the world. Second comes Chinese Mandarin at $8.7 Trillion - though this grouping has a higher growth of say 5-6% a year (rather than 2%) - Spanish is also important at $4.1 Trillion and Japanese at 5.9 Trillion and French at 5.8 Trillion.